We had another great week at Crosspointe. 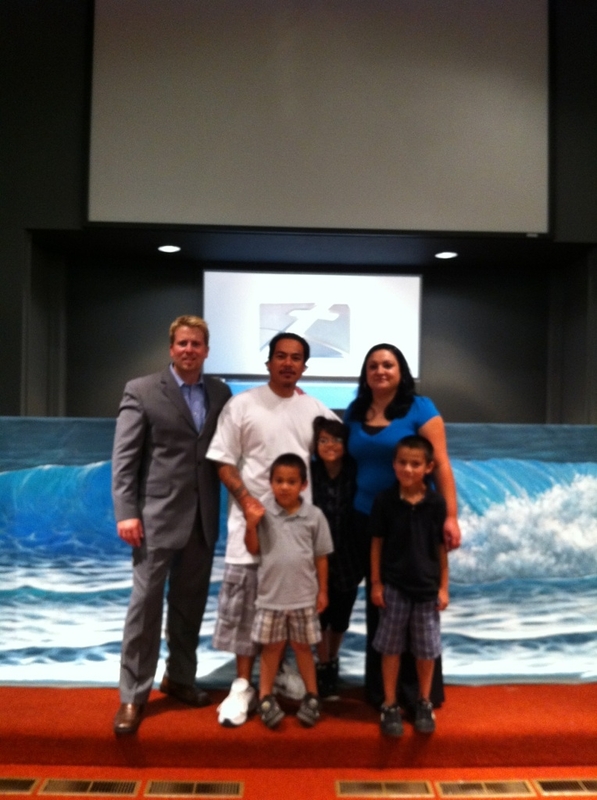 With one of our kids baptized and the kick off of the new series Soul Surfer inspired by the life of Bethany Hamilton. 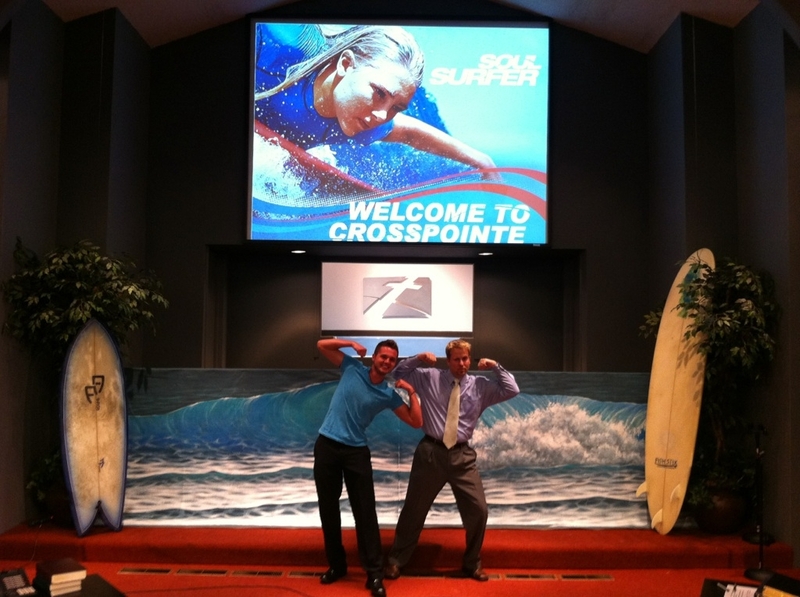 We have some awesome displays set up by one of our members to get people excited for the Soul Surfer series. I am excited to see what God is going to do here through the summer months. 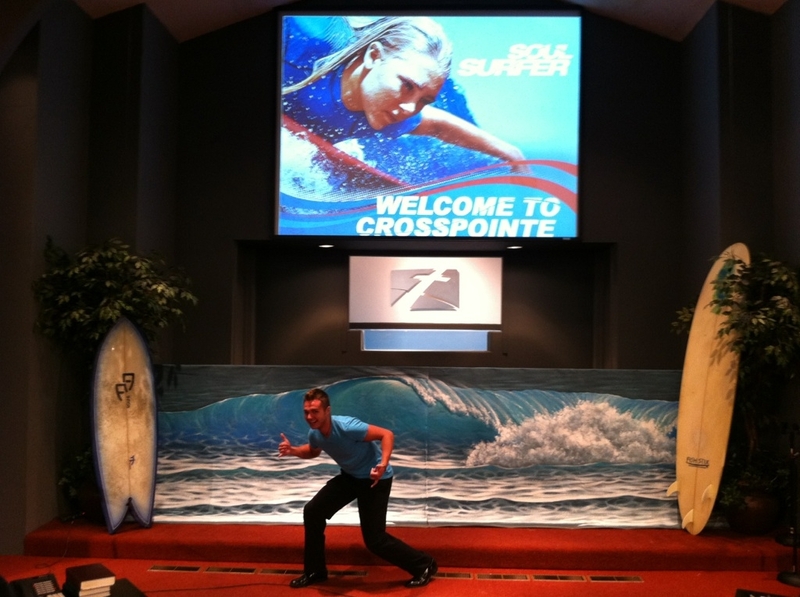 So thankful to Kyle for all his hard work to prepare for our Soul Surfer series. It looks amazing!!! God deliver us from people who want to be average. God didn’t make you just to deal with life he made you to do something big. An epic story is one that has someone overcoming great obstacles. There are many movies that tell an epic story such as Saving Private Ryan and Chariots of Fire. We are starting a series on Soul Surfer, this is an epic movie based on the real life story of an ordinary girl who overcame extraordinary circumstances. Epic stories involve overcoming conflict and can inspire the people who hear about it. For those of you who don’t know at age 13 Bethany Hamilton, a surfer girl in Hawaii, lost her left arm and almost her life to a 14 foot tiger shark. While some would let this end their surfing career Bethany, through faith, was able to get back on her surfboard a month after the attack and won fifth place in a national surf competition six months later. Today she is one of the world’s top surfers. Bethany has overcome this tragedy in her life and used it to inspire others and tell others about God. The movie Soul Surfer is based on her life as well as the documentary The Heart of a Soul Surfer. God is in the business of writing epic stories with people’s lives. God is an author and he has a book with your name on it and as the author and finisher of your life he authored the opportunity for your life to be an epic story. We need to look at difficulty as an opportunity for God to do something amazing in our lives. Jesus knows your name, but so does Satan. And Satan knows your weaknesses and he will destroy you if he can. Like a thief in the night Satan has a plan to destroy everything he can and take everything he can get. The path of Satan is a tornado of destruction. He has detailed plans to destroy and he will use your weaknesses. But Jesus is here to give you life and for you to have it abundantly! Satan is in the business of writing boring stories with people’s lives. The Christian life is not boring; it is about discovering the “why” of your existence. Peter trusts Jesus, in Luke chapter 5 he fell down to his knees saying “depart from me for I am a sinful man”. The epic stories are epic when the characters understand their role. The problem is when God uses us we act prideful and that is a dangerous situation to be in. Many times God uses us at the most unique and awkward times. What God is doing is writing an epic story in your life. God’s mission for people’s lives is almost always hard. We are faced with an easy road that leads to mediocrity or a hard road that leads to an epic journey. There is a common theme throughout the word of God: we are called to overcome.Bethany’s road was difficult but before she could get to the place where she was influencing many people she had to go through a great difficulty. Without Christ you will do nothing but fail but in Christ you can do all things. In the documentary Heart of a Soul Surfer there is footage ofBethanylying in the hospital after losing her arm and she says “maybe this happened so I can tell others about God”. It is easy to talk about how we are going to respond but it is hard to respond well when difficulty is knocking at your door. Warning #1: Living an epic story from God will be difficult. We all want God to use us when the road is easy but he uses us when the road is hard. When hardships come and we succeed people will ask how we could do it and the answer is God.Bethanywas able to share God because of her response to tragedy. God has a story to tell through you. God’s Mission for people’s lives almost always takes time. He has an executed end for you and me but it takes time for us to get there. Warning #2: Living an epic story for God will probably take a while. All I want out of life is for God to use me. I am hungry to change lives. Do you want it? I don’t want to spin my wheels, I want to change lives, I want to see people saved, and I want to do something for God. This is not all to entertain people it is to get them saved. In Christ you can have life and have it more abundantly. What would God do with you if you were willing to surrender to Him?